UpFront with NGS: Did Any of Your Ancestors Serve in the Revolutionary War? Did Any of Your Ancestors Serve in the Revolutionary War? Daughters of the American Revolution allows you to search for an ancestor for free at http://services.dar.org/public/dar_research/Search. If you find an ancestor and want a copy of the previously verified DAR membership you can order a copy online with a credit card for $10.00 each. Mail requests require a slightly higher fee. Ancestry.com has a number of Revolutionary War databases which you can find quickly by going to http://ancestry.com/militaryrecords where you will find a tab for each of the major wars. Through July 4th, Ancestry is offering free access to US Sons of the American Revolution membership applications, 1889-1970. You can also search Ancestry.com for an index to US Revolutionary War Rolls 1775-1783. If you find your ancestor, you will be provided his rank and where to find his service record on the National Archives microfilm. Ancestry.com also has a searchable index to Revolutionary War pensions, but not the pension files. I personally prefer to use http://www.footnote.com because Footnote has a copy of the soldier’s service record and the full pension file on microfilm. I did most of my Revolutionary War research at the National Archives before we had online databases, however it is great to have access to a digital copy, I can enlarge when transcribing a record. I like to use the advanced search to find my ancestors and select each “Title/Collection” one at a time, so I don’t receive too many results. 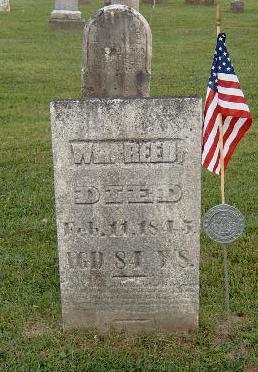 One of my favorite pension files is that of my ancestor William Reed/Reid and his widow Mary Reed because it contains their marriage certificate from 1783, which can be found at http://www.footnote.com/image/#1|13635650. The marriage certificate provides the details of their marriage, the location, and witnesses. I have included a transcription (see end of article) of the marriage certificate, as best as I have been able to decipher it, and also spotlighted it on the footnote website. I am amazed that Mary had held on to her marriage certificate for sixty-five years, including their migration across Pennsylvania in the early 1800’s. Today we just keep our important documents in a safety deposit box. She signed the pension affidavit with a mark. The file also provides her husband’s death date, the names of their children, and those still living in 1848 when she applied for the widow’s pension. Williams’ brother James Reed also provided an affidavit for his initial pension application. Because both William and James served in the war, I’ve built a time line of their military service in a word table and noted that none of their service was in the same regiment. A fourth source for Revolutionary War records is HeritageQuest which is available for free through many local libraries. When I search for William Reid in Pennsylvania, I quickly find twenty pages from the pension file from Record Group M805, Roll 681, Image 723, W 5676. The difference is the film used by HeritageQuest is the 20 most important pages rather than the entire file which for the Reed soldiers and widows pensions is 53 pages. Since I am still trying to find Mary’s parents, I wanted the entire file, not just the highlights. If you find your ancestor’s pension on HeritageQuest, you can then decide if it is worth a subscription to Footnote. The second way to think about the question, “Did your ancestor serve in the Revolutionary War?” is to consider those who were too old to physically fight, but supported the troops by providing food, wagons and clothing. I have another ancestor, Joseph Chamberlin, who was Commissioner of Clothing for Hunterdon County, New Jersey, 1777-1778. He was approximately 45 years old at the time. The records show the certificates Joseph Chamberlin provided relatives and neighbors for supplying blankets and clothing during the war. 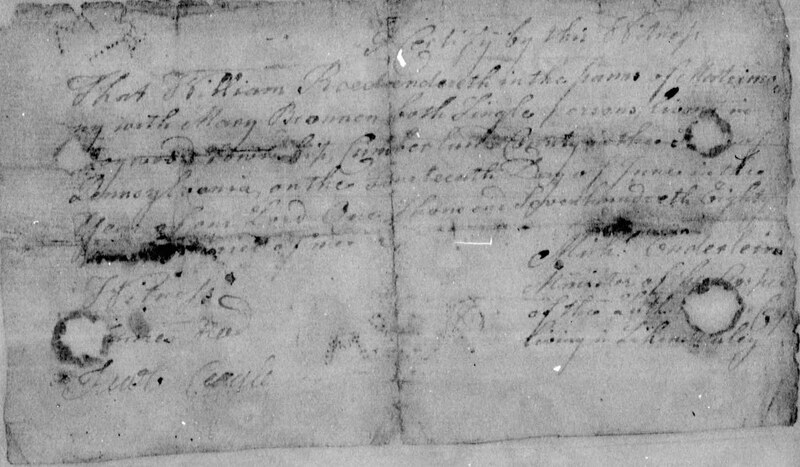 I am fortunate that his records and those for other commissioners in Hunterdon and Somerset counties have been transcribed by Dorothy Agans Stratford and Thomas B. Wilson, in Certificates of Receipt of Revolutionary New Jersey, Hunterdon House, Lambertville, New Jersey, 1996. Most county histories report the local militia lists and sometimes the efforts of individuals in the community who supported the Revolutionary War. Many county histories are available through HeritageQuest. Fortunately I can access HeritageQuest online through my local Herrick District Library. So as you wait for the 4th of July fireworks, you might want to do some online research and see which of your ancestors served. Witnesses of the Lutheran ? James Reed living in ?